This video tutorial shows Elizabeth Tyler breaking many rules of the traditional ways in which watercolor artists paint. In this large seascape painting other than brushes Tyler works with pens, pencils, ruler pens, color shapers, sponges and masking fluid etc. It’s fantastic when artists challenge certain styles which are stooped in tradition, it provokes a freshness and contemporary edge which I believe to be vital to maintaining the upkeep of the art world. ?She even uses sandpaper, saucepan scrubbers, razorblades and erasers for corrections. You can see how she still keeps control even when pouring strong color directly over the paper . Armed with a 2H and a B pencil and an eraser, this artist guides you through the process of drawing life-like hair from outline right up to the finished drawing. He adds all the shading and tonal qualities within the outline then works the eraser into the pencil to create suggestions of highlights on hairs. An excellent video for beginners to learn from. This video art tutorial shows you how in quite a short space of time you can draw calm sea waves in charcoals. It is definitely geared towards the beginner to intermediate artist but I actually learned a few ideas from this video myself. Using fine willow charcoal the artist begins by applying a series of quick horizontal lines in a variety of lengths with longer ones at the front and the shorter ones�receding�to the background and gives the illusion of perspective. When using charcoals contrast is key to establishing a realistic picture so with respect to the waves it is essential to get the darker values and tones in your foreground and as you can imagine a gradual grading of mid tones working their way to the distance. The introduction of a blending stump is used to smooth the harsh rugged lines left by the charcoal and is complimented by a compressed charcoal pencil which is used to further create even more dark values to the larger foreground waves. The white charcoal pencil is appropriate to add finer detailing to the tips of the waves offering highlighting capabilities which gives them form and a�heightened�state of realism. You can’t go far wrong with following this tutorial and as I’m sure you would agree it is easy to follow and great to learn from. Have fun. This is an excellent video tutorial to learn how to draw lips and teeth from in a realistic way. This is quite literally a step by step video with sped up moments and great quality narration. The artist talks about cross hatching techniques and how you can expect to gain 3D depth, shading highlights and intricate detailing around the teeth and certain areas of the lips. The beginner would have no problems learning to sketch from this. An array of different softness pencils are used throughout. If wanting to learn how to draw film stars is your thing then this is the video for you. 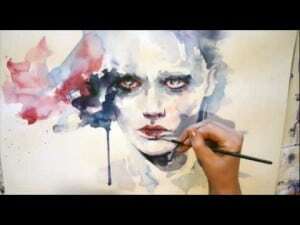 It is a realistic time lapse video drawing of actress Angelina Jolie. 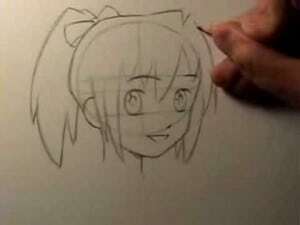 The artist uses a 7B, 4B, 2B, 2H, 4H, blu tac(eraser) and q-tips to achieve their desired result. There’s no narration just a soundtrack over but it does allow you the insight into which features the artist sketches first and how they’re tackled. David Gray shows you how to paint realistic portraiture in this oil painting demonstration. This is possibly some of the finest oils work I have seen recently and is on par with some of the great traditional masters of oil painting. This art demonstration is time lapsed throughout and is engrossing from the start. The way David Gray moves the paint brush around the canvas gradually stepping in and out of complimentary soft tones to paint the face is absolutely outstanding; this really is traditional oil painting at its highest standard. The canvas is pre sketched by the artist to give him a visual aid for where the tones and highlights cast on the face are to be applied with the oil paints. He uses three different sized round bristle brushes to construct his masterpiece each one being used in a very similar way to cover large areas of skin as well as the finer intricate details. With the small round brush he applies the oils masterfully to gain outlines of the key features like the eyes, nose and mouth. Gray works from the top down making sure he finishes the area which he is painting fully before he moves on. He uses the small and medium brushes to apply the oil paint and gather the various skin tones and regularly introduces another dry medium brush to blend the areas to create a smooth transition from area to area. He concentrates on painting roughly one inch squared of canvas at a time making fully sure that it is completed and resembles the visual reference he is painting from. This art video on how to paint realism in oils is truly magnificent so be sure to leave your comments at the bottom of the page and visit David Gray at his website and support art online.